The Sooner State received its nickname from the settlers who went just a little bit earlier than they were supposed to in order to claim the territory's newly-available land. From Girl Scout cookies to parking meters, Oklahomans have had a long history of notable firsts ever since. Here are 25 remarkable facts about the panhandle state. 1. Located at the western-most tip of Oklahoma’s panhandle, Cimarron County holds the distinction of being the only county in the U.S. to border four other states (Kansas, Texas, Colorado, and New Mexico). 2. In 1983, native Oklahoman Gordon Matthews patented his "voice message exchange" which Forbes described at the time as "a computerized telephone message storage and retrieval system with greater capacity than a tape recorder and a novel ability to reroute and replicate messages." Today we know know it as voicemail. 3. Okies are so proud of the Rodgers and Hammerstein musical bearing their state’s name that “Oklahoma!” is the official state song. But this choice wasn’t met without opposition—when the bill to change the state song was introduced in 1953, an older legislator responded by walking up to the podium, softly singing the old state song “Oklahoma—A Toast,” and breaking into tears. The house responded with a roar of applause. To counter that, the legislator behind the new bill assembled a choir from the Oklahoma College for Women and returned later to give a rendition of his own. The performance was so impressive that the bill was passed through. 4. Girl Scout cookies were first sold by the Mistletoe Troop of Muskogee, Oklahoma, in 1917. 5. Appropriately, it was an Oklahoma City Girl Scout by the name of Katie Francis who shattered the organization’s previous records when she sold over 20,000 boxes of cookies in 2014. After asking potential customers if they were interested in buying, her strategy was to tug on their heartstrings by performing an impromptu song and dance number. 6. Collectively, Oklahomans spend about 3.5 million days hunting each year. 7. The first-ever shopping carts were introduced to Oklahoma City’s Humpty Dumpy supermarket chain in 1937. While they were initially a flop amongst shoppers, they gained popularity after the inventor hired models to push them around his stores. 8. The town of Beaver, Oklahoma, prides itself on being the cow chip throwing capital of the world. Every year it hosts the World Championship Cow Chip Throwing Contest where participants compete to see who can hurl their dried cow pats the farthest. The winner of the 2014 competition cleared 149 feet 10 inches. 9. Located along the infamous Tornado Alley, Oklahoma is the most tornado-prone region in the country. Over 3500 recorded storms touched down in the state between 1950 and 2014. 10. The state capitol building in Oklahoma City is the only capitol located directly above an active oil well. 11. 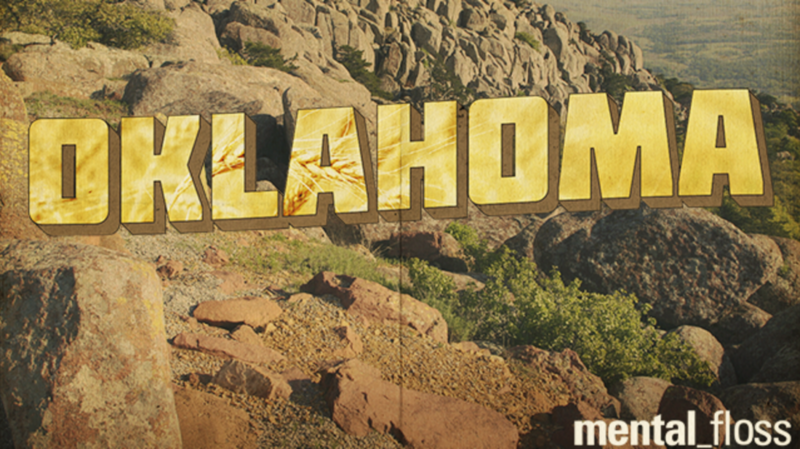 Oklahoma’s official state poem is titled “Howdy, Folks!” It was penned by Oklahoma native and cowboy icon Will Rogers. 12. Visitors to Oklahoma City can check out the American Pigeon Museum. In addition to providing an extensive history of the birds’ roles in both World Wars I and II, the museum also includes pigeon-themed paintings, sculptures, and even live flight shows. 13. Whaling is illegal in Oklahoma. There is at least one whale located in the land-locked state, but the Route 66 attraction known as the Blue Whale of Catoosa is made of cement. 14. Despite its distance from the ocean, Oklahoma boasts approximately 55,646 miles of shoreline. Much of this is made up by its over 200 manmade lakes—more than can be found in any other state. 16. During World War II, Boise City was the only U.S. town to have a bomb dropped on them via airplane. What made this case even more remarkable was that the perpetrators weren’t German or Japanese forces but American troops who had botched a training exercise. Though several buildings were damaged in the town’s center, thankfully no citizens were harmed. In line with the patriotic climate of the time, the mayor issued a statement the following morning praising the bombers for their accuracy. 17. The world’s first parking meter was installed in Oklahoma City in 1935. 18. Computer pioneer Edward Roberts attended Oklahoma State University to study electrical engineering. He eventually abandoned his college career and instead went on to develop the world’s first personal computer in the mid-'70s. 19. Bluegrass and folk fans, take note: The American Banjo Museum, which hosts the largest collection of the instruments on public display in the world, is located in downtown Oklahoma City. 20. Oklahoma is home to the Will Rogers World Airport and the Wiley Post Airport. The two famous Oklahomans both died in the same plane crash. 21. On the grounds of the Oklahoma governor’s mansion is a panhandled swimming pool in the shape of the state's boundary lines. 22. Oklahoma City is the site of the historic National Cowboy and Western Heritage Museum. Notable items include pieces donated from the personal collection of John Wayne, who was a member of the museum’s board of trustees from 1968 till his death in 1979. 23. Oklahoma boasts the highest density of indigenous languages in the U.S. There are over 40 distinct Native American languages spoken in the state. 24. Oklahoma is the only state that produces iodine—an important element used in various types of medicine. It’s a byproduct of the state’s natural gas wells, which draw up iodine-rich brine water from the salt deposits deep beneath the surface. They produce so much of it that the U.S. is third behind only Chile and Japan in terms of iodine production. 25. Oklahoma’s official state meal is truly a gut-buster: it consists of squash, corn bread, fried okra, barbecue pork, grits, biscuits, sausage and gravy, corn, strawberries, chicken-fried steak, black-eyed peas, and pecan pie.